Home Education How to Find All Old NCERT Books Online? Founded in September, 1961, the NCERT (National Council of Educational Research and Training) is an autonomous organisation established by the central government. It is registered as a literary, scientific and charitable society under the Societies’ Registration Act (Act XXI of 1860). It is tasked with the primary responsibility of conducting and supporting educational research programmes. And offering training in the latest educational research methodology and techniques. NCERT also publishes several academic books and provides sample question papers which are used extensively across government and private schools pan-India. NCERT books are also used extensively for preparing for several prestigious competitive academic examinations including; UPSC Exam (Prelims, Mains), IAS, Civil Services, IFS, IES and other such career-oriented examinations. However it’s not easy to find old NCERT books – which are said to be more lucid and in-depth than the newer versions when it comes to helping students prepare to crack such tough examinations. To help resolve this issue for you, we have listed below some ways you can go about finding old NCERT books to help you prepare and surpass these exams yourself. Ancient India– R.S. Sharma, (CLASS-11), Medieval India – Satish Chandra (CLASS-11), Modern India – Bipin Chandra (CLASS-12) and World History – Arjun Dev (Class-12) and The Story of Civilization – Volume 1 by Arjun Dev (Class 9) – are some of the old NCERT books listed for sale on this site. Most of the titles listed here are tagged with attractive discount offers and also offer cashback facility. This popular online marketplace offers a wide selection of NCERT books – covering subjects like Chemistry, Mathematics, The Indian Constitution, Biology, Physics, English and Social Sciences to name a few. Most of the books available carry a 4+ customer rating and are priced from a few hundreds to a couple of thousand rupees depending on the subject and demand for the book. You can also get lucky on popular classified sites like OLX (and Quikr). There is a good chance that a student who no longer needs the old syllabus NCERT books may have posted them online for sale. Just type – old syllabus NCERT books + the name of your city and review the available options. This online resource for second-hand books also has a good collection of old NCERT books for sale at big discounts ranging from 20-80%. NCERT Books on sale here cover subjects like; Engineering, NEET guides, electronics & communications, MBA and GRE Preparatory books among other choices. 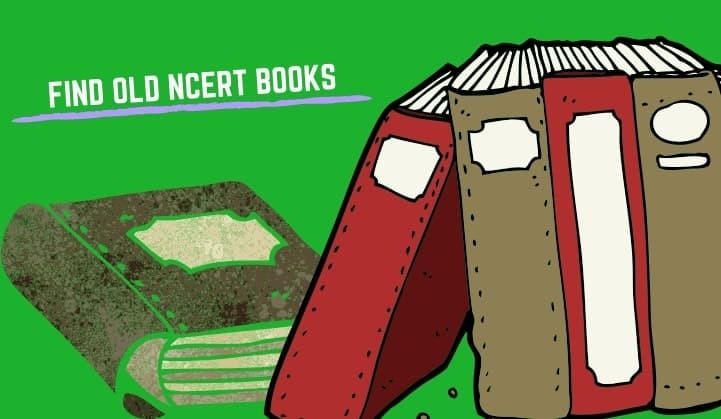 Central Books is an online bookstore which specializes in academic books, children’s books, competitive books and stationary supplies – also has a decent collection of old NCERT books (from Class 1 – 11) to offer. These include English Marigold workbooks (Class2-3-4-5), books on Economics, Science, Mathematics, Physics, Social Sciences and Environmental Studies among others. This Delhi-based book distributor, who also has an e-store, is a good bet for finding old NCERT books. All you need to do is visit their website (listed above) and type – old NCERT books – in the search option to see the list of available options. If you do not find the ones you need here, you can always check for the availability of photocopied versions – which are still in high demand among students studying at Delhi’s many coaching classes. They also ship to all major locations across India and major in India and accept online payment, including PayPal. This free education app on Google Play offers a treasure trove of NCERT books – for free. This includes NCERT Chapter videos, NCERT Solutions and Doubt Discussion and CBSE Textbooks of Class 1-12, in English, Hindi & Urdu Medium. You also get the option of downloading them in one click and reading the NCERT book PDFs offline or online, without having to register or login. This site makes it possible for students to download old NCERT books in a PDF format – for free- with the request that the material is not used for commercial purposes. This website which claims to be India’s largest online community for IAS, Civil Services exam aspirants offers free PDF downloads of old NCERT books in both English and Hindi. The books cover a host of key subjects which include; Science (Class 6-10), Ancient Indian History (Part 1-4, Class 11), Physical Basis of Geography (Class 11), World History (Part 1-3, Class 12), The Story of Civilization (Part 1-2, Arjun Dev), Ancient India (Romila Thapar/Makhan Lal/R. Sharma) and the Economic Commercial Geography of India (Class 10), among several others. This site is a good online resource for locating distributors for NCERT books across major Indian cities. It also lists their contact and location details. This will make it easy for you to get in touch with the distributors in your city directly and inquire about the availability of old NCERT books syllabus in their inventory. Old NCERT books syllabus are important for most of the competitive examinations because of the high-quality of their study material and other resources. This makes them an important reference tool for students looking to ace tough competitive examinations like the Civil Services. If you too are a civil services examination aspirant, we hope that many resources mentioned in this article help you find the old NCERT books you need for your own preparation. Do study hard and we wish you the very best of luck in your coming examinations.